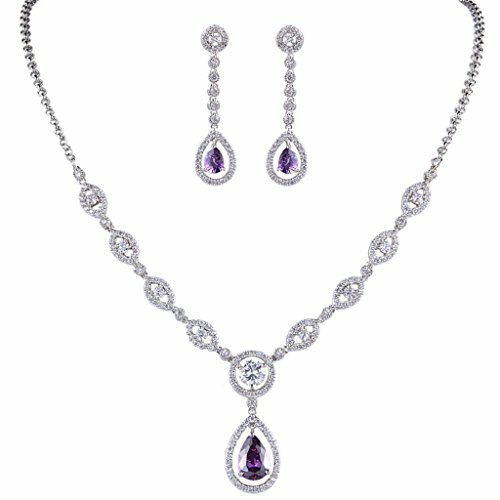 This fabulous jewelry is made of cubic zirconias and Austrian crystals, making you feel more ladylike.Sparkle under lights, telling its quality to everybody. Cubic zirconias are pronged and paved to the jewelry item to secure from loosing. Necklace Length: 46.3cm(18.22")-51.8cm(20.38"), Attachment Size: 1.5cm(0.59") by 3.5cm(1.37"), Earring Size: 4cm (1.57") by 1cm (0.39"), One Earring Weight: 2g. Wrapping: Come with some spare crystals(zircon excluded), a gift box and a favor bag. If you need assistance please contact us.